UPDATE 6/10: Some interesting tidbits about Long Tao’s name 龙韬 here. Prof. June Dreyer points out that it refers to one of the Six Secret Teachings, which may make it a veiled call to cast aside officials who stand in the way of the suggested plan. UPDATE 30/9: The Global Times has now posted an English version of Long Tao’s article. Possibly a response to the Japanese- Philippines “strategic partnership” and Japan’s further “wading” into the South China Sea dispute. The internationalization of the South China Sea issue is perfectly clear, but it has not completely taken shape yet. The author believes now is a golden opportunity for China to coolly assess, grasp the opportunity, and take swift and definitive action. At present every country is engaging in an arms race, procuring long-range maritime control weapons. Even Singapore, which is not part of the South China sea dispute, is preparing to introduce advanced stealth fighters. Australia and India’s military plans are in order to make world-class preparations, and Japan doesn’t want to be left behind either. America is energetically selling armaments with one hand and pouring petrol on the fire with the other, and at the same time is preparing to intervene militarily. [. . .] One should not be afraid of small-scale wars, for they are a good way to release fighting potential. By fighting several small wars one can avoid a large war. 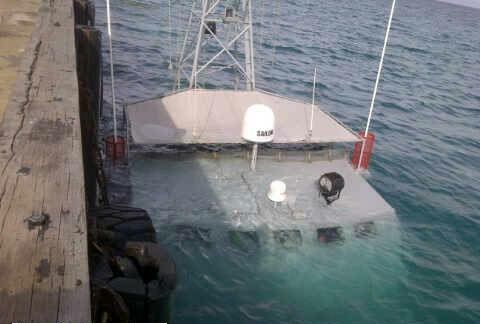 Malaysian ship breaks down chasing Chinese frigate? According to a September 19 report in the New Straits Times, the Malaysian Navy patrol boat KD Pari sustained a dislodged shaft and nearly sank while pursuing a Chinese-flagged vessel near Danwan Reef 弹丸礁 in the Spratly Islands. The report claimed that when water started filling the KD Pari’s engine room it was forced to abandon its pursuit of “a foreign vessel violating Malaysia’s territorial waters”. But the Global Times‘ treatment of the translation is even more interesting: for a start, the reference to a Chinese vessel that the Global Times emphasizes was actually just a single sentence in the original story. RMN chief Admiral Tan Sri Abdul Aziz Jaafar said the crew of the Fast Attack Craft-Gun (FAC-G) vessel KD Pari heard a ‘loud bang’ soon after it had departed the island westward to pursue a China-flagged vessel, believed to be a frigate, spotted at Gugusan Semarang Peninjau in the South China Sea at 2.53pm. This can probably be attributed to the GT’s translators/editors needing to find a local angle to attract Chinese readers’ interest. But the Global Times‘ direct quote referring to “a foreign vessel violating Malaysia’s territorial waters” is simply nowhere to be found. Malaysia has not accused China of violating its territorial waters. This too may be explained by the commercial imperative to play up the conflict and create a dramatic crisis narrative of China being encroached upon from all sides. But putting such menacing words into other countries’ mouths like this seems very irresponsible for a People’s Daily-owned, Beijing-based newspaper. So who would stand to benefit from blowing up a story like this? It probably doesn’t do much for hardliners advocating a stronger stance in the South China Sea, since the idea of yet another Southeast Asian country opposing China’s presence might make military measures seem even more futile. But stories about Chinese ships being chased out of the South China Sea by “little” neighbouring countries obviously does nothing for the cause of foreign policy moderates either. What is clear is that by confirming the strong domestic narrative of China being encroached upon from all sides, stories like these feed a public perception that the government in Beijing is weak, and is even allowing China to be violated, bullied and humiliated. At a time when China is supposed to be ascending to a position of greatness in the world, it is perfectly understandable if many Chinese people find this hard to accept. Update 29/11: An “alternative explanation” for this incident that appeared on a Chinese forum and has attracted a moderate amount of interest, and much agreement. 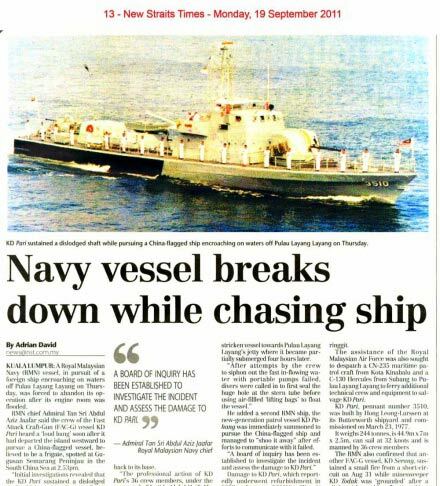 The “netizens” claim, or rather, wish, that the KD Pari was actually sunk by the Chinese warship, but that Malaysia was too embarrassed to admit this, so it claimed instead that the boat had….simply failed. The news that the Indian Navy ship Airavat had been told over radio that it was “entering Chinese waters” while sailing in the South China Sea on a “goodwill visit” to Vietnam may have marked the start of a new era in the South China Sea dispute. Soon after, last Thursday, September 15, the Global Times reported that India plans to develop oil and gas, claims to already have “Vietnamese approval”. The report said India’s foreign ministry had expressed disregard for Chinese objections, saying that “China’s opposition has no legal basis”. It is perfectly permissible, it seems, to criticize the central government’s weakness and inaction in the boldest of terms, as almost every entry on this blog has documented. But to actually question whether China’s claims are valid probably crosses the line into the disharmonious, at least this time and on Phoenix (an earlier post on NetEase asked a similar question but remains unharmonized). 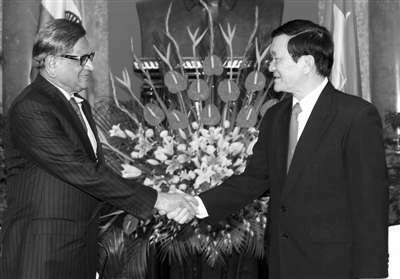 On September 16th, the Indian and Vietnamese governments announced they would step up cooperation in the areas of military affairs, trade and investment, and culture and education. At a meeting of the two countries’ foreign ministers in Hanoi, Vietnam declared “full support” for an Indian company’s plans to exploit oil and gas resources in the South China Sea. Just a few days ago the Philippines military announced its intention to purchase another second-hand US warship to patrol its South China Sea claims – on the very day President Aquino left China after a successful state visit. Combined with exaggerated state media accounts of China’s beneficence in agreeing to billions of dollars of new investments in the Philippines, this left many Chinese “netizens” feeling that China had been humiliated. 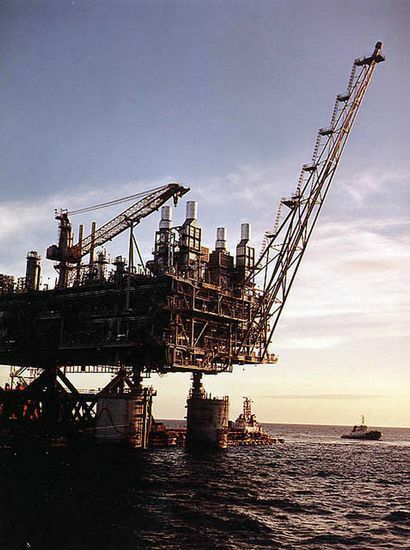 The Philippines government announced yesterday that US$117 million in licence fees from the country’s Malampaya gasfield in the South China Sea will be used to upgrade military installations. According to reports, the money will be used to purchase helicopters and warships and build radar stations to strengthen “defence” of oil and gas resources in the sea, where disputes exist with China. 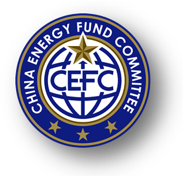 The Chinese government has not yet expressed its view of these developments. Although the story originated with provincial website Zhejiang Online (link now broken), it was among the top headlines on the front pages of major web portals NetEase, Sohu and Phoenix Online, and remained on prominent display throughout the course of September 8. Anonymous (Shanghai): They just sign a deal worth hundreds of millions, go home and use the money to build radar stations….. The wits-end tone of these comments, and in particular the popularity of the third comment, might suggest that “nationalists” are accepting that their (possibly GFC-inspired) hopes for a more muscular foreign policy were unrealistic. If so, this could be a positive trend in the sense that hardline factions within the state who might want to mobilize public pressure in favour of militaristic goals or their own ascendancy within the Party will have a hard time making that happen. A case of the Hawks Who Cried “Wolf!” perhaps? It is also interesting to find the view that the South China Sea issue is irrelevant finally find expression. Of course, this comment could be (and probably was for at least some of the 1600+ readers who indicated agreement) an ironic, indirect way of disowning the CCP government’s weak actions (i.e. that the CCP’s weak policies have nothing to do with the commenter, not that the South China Sea issue is irrelevant), but it should be assumed, despite all the anger and ranting online, that indifference may well represent the views of a usually silent but overwhelmingly large majority. More generally, this latest episode adds further weight to the conclusion that the Communist Party’s often-touted “nationalist legitimacy” may in fact be largely irrelevant. If people care at all, they seem to think the party-state is acting in their own interests, as distinct from the national interest. By all accounts Philippines President Benigno Aquino III’s visit to China from August 30 to September 3 was a roaring success. More than 300 businesspeople and 13 cabinet members went along with the President, and they apparently got what they wanted and more: $1.3 billion in guaranteed Chinese investment in the year ahead, and up to $14 billion over the next five years. The South China Sea front was relatively quiet, in keeping with the official rhetoric in the lead-up to the trip (Google news finds 2,375 stories on the topic of , namely that the dispute would not be allowed to affect economic cooperation. 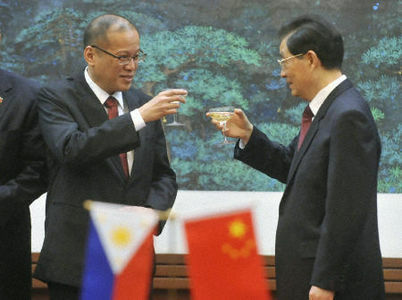 In China, much was made of Aquino’s feel-good “root-seeking” trip to Fujian Province on September 3. However, on the day the President left with billions in new investments secured, the Chinese press pounced on the Phillipines military’s announcement* of the upcoming purchase of another second-hand US warship: Just as Aquino concludes China visit, Philippines announces purchase of another warship for the South China Sea, shrieked headlines across the country, from Chongqing to Fujian and seemingly everywhere in between. Using China’s money to buy American warships to interfere with China. That’s really lofty! This is a good model of “shelving disputes and developing jointly”! China and the Philippines are friendly, increase investment!??? America’s running dog, this is exactly the American way. Shelve differences, jointly develop, yes! yes! yes! yes! yes! yes! It’s a pity the Sohu thread doesn’t include information about how many people recommended each post. More than 22,000 individually written comments would suggest, at a guess, at least 100,000 participants in the discussion, a pretty big number even by Chinese standards. It’s hard to disagree – Hu does indeed seem to have been slapped with a wet trout. But the “netizens” don’t seem to realize that people around the world pay almost no attention; what seems to them to be a loss of face for the Chinese nation in front of the world is far, far more of a loss of face for the Chinese Communist Party in front of the Chinese nation. MANILA — The Philippines hopes a territorial dispute over the South China Sea will ease after President Benigno Aquino’s trip to China, the nation’s military chief said Saturday. But Manila will continue to build its naval patrol capability, General Eduardo Oban said, adding that he expects the Philippine navy to acquire a second Hamilton-class cutter from the United States next year.